Justa Pleasure Farm is a family run farm, owned and operated by Brent, Diane and Wyatt Stovall. Diane was born a horse crazy girl and never outgrew it. With the hard work and support of her family–she is now living her dream. The Stovall family has owned Justa Pleasure Farm since 1996 and invite all to come and learn complete horsemanship. Diane focuses on teaching people about horses, horsemanship, and the responsibility and commitment you need to be able to have a positive relationship with your horse. She encourages all to take lessons and learn as much as you can about horsemanship. 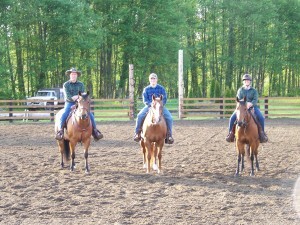 Diane teaches horsemanship from groundwork to under saddle. She truely believes in getting respect on the ground with your horse FIRST and then under saddle. She strives to teach her knowledge and share her experiences in horsemanship in an easy to understand format for both kids and adults. Brent and Wyatt are the back bones of the farm.They are always working hard at creating,caring for, and maintaining the farm. They harvest the best hay each year that feeds lots of special horses. JPF could not be what it is without them both. BEHIND THE SCENES: The farm also has a select group of extended farm family who they couldn’t do without. They know who they are and we thank them all. Hay buckers, photo takers, stall cleaners, chuck wagoneers, assistant coaches and friends! The journey with horses has no ending.